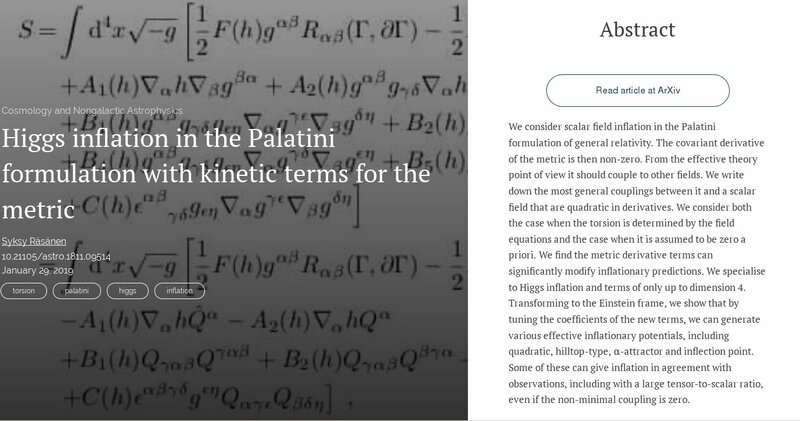 This entry was posted on January 29, 2019 at 10:52 am and is filed under Open Access, The Universe and Stuff with tags General Relavity, Higgs Inflation, Open Journal of Astrophysics, Palatini Formulation, Syksy Räsänen, Torsion. You can follow any responses to this entry through the RSS 2.0 feed. You can leave a response, or trackback from your own site. Open Journal of Astrophysics is open ! Excellent news and congratulations to all. What is meant by the “first new paper”, please? As abstracts of other papers appear on OJA’s online frontpage I’m a bit confused. It’s the first paper processed through the new platform. The other four are `legacy’ papers published through the older version of the site. I should clarify in the post. As a typography curmudgeon, I have to ask about the reason for the space between the exclamation mark. This seems to be some new fad. Perhaps Anton was spaced out when he wrote it. I have taken to including a space between a letter ‘l’ (ell) and a following exclamation mark, since they are often harder to distinguish on computers than on paper. I did it here too out of my new habit. But please look at some Victorian books to see a space often inserted between a word and a semicolon following it. Syksy Räsänen is one of the leading lights in his field, so just having him publish in the OJA should substantially boost your cred. In the PDF at arXiv. Same DOI as at the OJA itself, so probably there is a typo or it isn’t yet activated. It takes a while for it to be activated .. The doi fairies have done their work overnight and it is now registered.. The background is not some fantasy blackboard, but from page 3 of the paper. Is the OJA now Plan-S compliant? It seems to me that most people now pushing open access—at least those in a position to have a strong effect—have been duped. The main point is not access to the paper, as most stuff is on arXiv (or could be). (Some journals (including MNRAS and, I believe, the main APS journals such as Physical Review) allow the final version to be on arXiv—and one shouldn’t publish in a journal which doesn’t—and even if formally only the “author’s accepted manuscript” or whatever is allowed, I doubt that people who update arXiv with the final version will have a problem, and there is probably little substantial difference between the accepted manuscript and the final version anyway.) The main point should be getting rid of exaggerated fees. Most of the discussion seems to be concerned with how to pay publishers in return for making articles open access via the gold model. As I’ve said before, this might even make things worse if the fee is paid at a high (perhaps even national or international) level, since the author might not be aware of how high it is (he knows what page charges and article-processing fees are if he pays them himself, and the institute knows what a subscription costs). The danger I see is that Plan S and related initiatives will come up with some white list of journals where people can publish and comply with open-access directives. Will the OJA be on it? Commercial publishers have a motivation for making sure that it is not. As Syksy mentions in a thread on his twitter account, he (now a holder of a permanent job) published a single-author paper in OJA, but his students still need the stamp of approval from respected journals. The only way this can change is for the OJA to acquire a good reputation, which means publishing only good articles (necessary, but perhaps not sufficient). Despite its relatively low profile, I don’t think that the OJA has gone unnoticed by commercial publishers. If people publish in the OJA, will it make it more difficult for them to publish elsewhere (perhaps as co-authors with students who still need the stamp of approval)? If so, what can be done to combat this? What about a public statement of intent, signed by influential people in the field of astrophysics/cosmology/astronomy, to the effect that when hiring they will consider, with regard to publications, only the quality of those publications (perhaps quantity as well, not per se but in the sense that one good paper is probably not enough), explicitly not judging quality by association (e.g. published in a journal with high impact factor—interestingly, since the citation distribution is highly skewed, a typical paper in a high-impact journal will probably have fewer citations than a typical paper in a journal with lower impact factor)? This could go a long way to establishing the OJA. It’s probably not enough if people do this but don’t say so publicly, since the struggling student can’t afford to take chances. On the other hand, if you can’t get a substantial number of signatories within a reasonable time, the OJA probably won’t make much difference. Yes, those signatories will risk something, but risk much less than a student who isn’t hired because he published in the OJA rather than elsewhere. We don’t know for sure what the final requirements for Plan S will be. The consultation closes on 8th February. As things stand the only thing we’re missing is membership of DOAJ, for which we don’t yet qualify because the journal has to publish at least five papers a year. Given that we have quite a few papers in the pipeline – some of which have big name authors – we expect to reach that soon. There may be additional requirements on metadata, but those will probably be trivial to fix. The idea behind OJA and other such journals is to put the people who charge, one way or another, large fees for access, out of business. Yes. But this will work only if a substantial number of people publish in the OJA rather than in overpriced journals. The question is, what can make that happen? Just being available is probably not enough; it has to be recognized as a “good” place to publish, both in terms of being on white lists or whatever, and in terms of reputation. I don’t see overpriced journals just shrugging and giving up. They will presumably try to discourage people from publishing on the OJA and similar journals (should any arise). Probably only a public action supported by many and/or influential members of the community (see my suggestion above) could change things. Financial incentive is strongly on OJA’s side. After that, it takes hard work to gain a reputation, and Peter is showing the necessary commitment. I don’t doubt Peter’s commitment. If cost were the only issue, then the transition would be faster. There is the problem of people accepting the journal as a reputable one. There is the obvious chicken-and-egg problem: people won’t publish in it unless it is reputable, and it won’t be reputable unless people publish good papers in it. Obviously, the first step has to be people brave enough to publish in it, such as Syksy and the authors of the other three papers. But several more are needed. A more serious problem is those who are most dependent on reputation, namely, those without permanent jobs, might be understandably unwilling to sacrifice their career on the alter of morality. Thus, most people making the first step need to be people with permanent jobs—not only because they are risking less, but also because they will probably bring more respectability. However, these are people who have published in the same journal for years or decades, are in positions where they don’t have to directly bear the costs, and also might fear disadvantages of publishing in the OJA (such as problems with publishing in other journals, which (a) they might have to do because of co-authors and (b) it is always a good idea to be on good terms with at least two journals, and as long as there is no alternative to the OJA (and I don’t see establishing one as an easy goal), that means established and at least in some respect commercial journals). The next step needs to be a public statement by as many bigwigs as possible, so at least people applying for jobs with them will not have to fear that the lack of papers in established journals might keep them from getting a job. Were they people in a committee?